As the conference room on the third floor of the Whitehead Campus Center filled with students, Professor Ben-Porath stood chatting with the students and administrators who had participated in an earlier dinner and discussion as members of a selected “Discourse on Discourse” reading group. 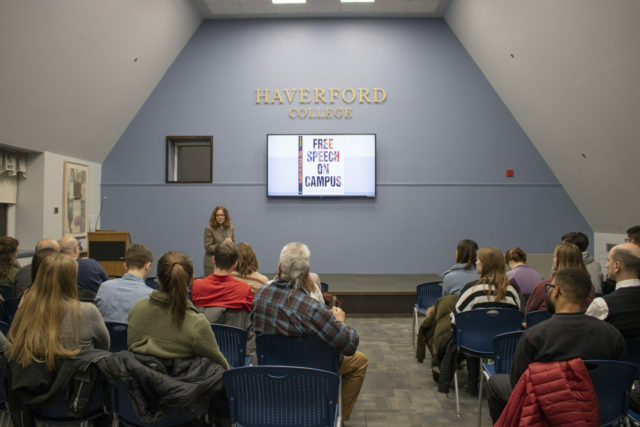 On the screen above her were emblazoned the words “Free Speech on Campus,” the title of her most recent book and the topic for the night’s talk. 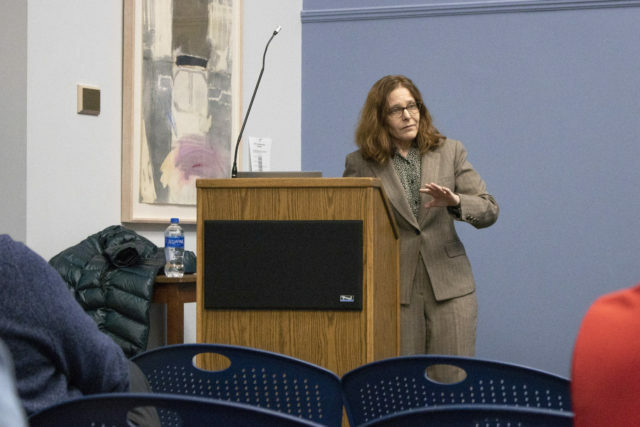 Dr. Ben-Porath began her talk by reviewing the history of free speech activism on college campuses, covering Vietnam War protests, the Sweatshop Riots of the ‘70s, and Morse v. Frederick. Throughout her talk, Ben-Porath was careful to recognize the many viewpoints that often come into conflict regarding free speech on college campuses, at one point joking that her wintry photograph of a college campus was where we might find the “snowflakes,” a term commonly used by right-leaning people to criticize supporters of policies seen as overly-sensitive for students. Most importantly, Ben-Porath highlighted what it is about college campuses that makes free speech such a recurring issue on them. She stated simply, “Campus is unique. We need and have our own rules.” She continued with plagiarism as an example: cheating and lying have punitive consequences in a college, while for a person in office cheating and lying count as protected speech. 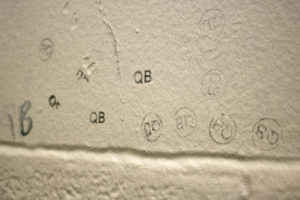 In this sense schools are a place where freedom of speech is already controlled in some way. Dr. Ben-Porath’s framework for promoting free speech while recognizing these requirements inherent to schools is called “Inclusive Freedom,” which acknowledges the need to strike a balance between intellectual risk and dignitary safety. While conceding that in reality the distinction between intellectual risk and dignitary safety is not as clear-cut as it can seem on paper, Ben-Porath articulated the tension between students’ need to explore ideas and need to feel respected in regard to race, gender, and other categories. Dr. Ben-Porath acknowledged that the burden of discourse is unevenly distributed among students, with a greater share falling on minorities. For some students this was an important component of the talk. 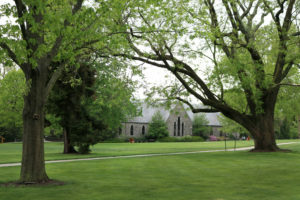 “While I did not completely agree with her provided explanations for current campus unrest surrounding free speech, I appreciated her recognition that open expression on campuses places particular burdens on students with marginalized identities, and that part of the administration’s responsibility is to alleviate these burdens as much as possible,” said Hanae Togami ‘19. Dr. Ben Porath ultimately suggested an approach of “effective advocacy” and urged students to “call in and don’t call out.” She warned against being resigned to civility, since a teacher can be perfectly civil in a classroom while still being exclusive. She also stressed that the dialogue problem cannot be solved with more rules, analogizing this to a situation where one is perpetually trying to close the barn doors after the horses have escaped. 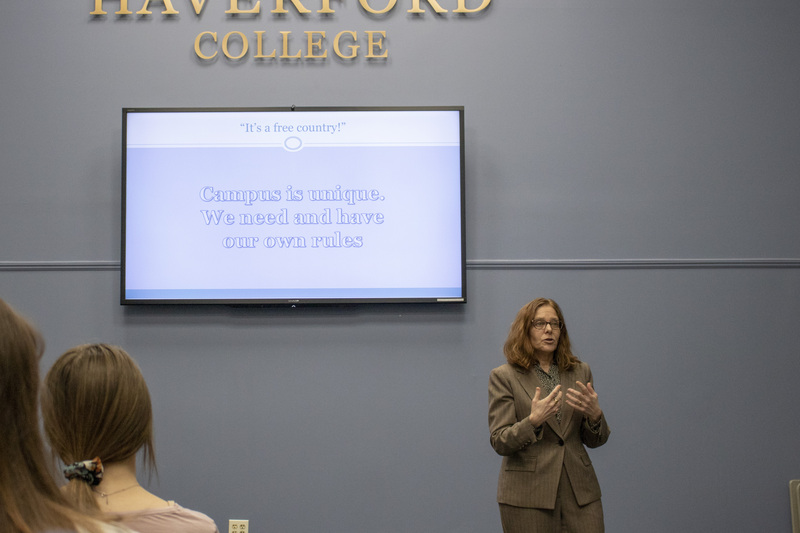 As she answered several questions, Dr. Ben-Porath modeled the dialogue she hoped would take place at campuses across the country. 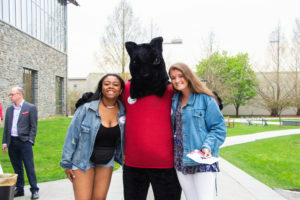 She noted that Haverford is a small, tightly-knit school, which could cause social pressures to be more acutely felt than might be the case in the more porous community of a large university. 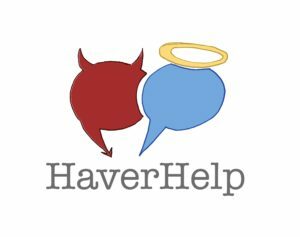 Our school’s size aside, with this presentation, Haverford is taking part in a national conversation.